Don't know whether to put ?! or !? ...?
? + ! = ‽ Interrobang! This group is for all those who like/love/use the INTERROBANG. Everyone, raise awareness of the interrobang! Put it in your sig, post links to the group etc. etc.! The question mark frequently comes first (to emphasize that it is a question), although there is no universal style rule on the subject. Like multiple exclamation marks and multiple question marks, such strings are generally considered poor style in formal writing. Writers had combined question marks and exclamation points (along with using multiple punctuation marks) for decades before the interrobang was invented. They were prevalent in informal media such as print advertisements and comic books. They are also currently used in algebraic chess notation with "!?" showing an interesting move that may not be the best, and "?!" showing a dubious move that may be difficult to refute. 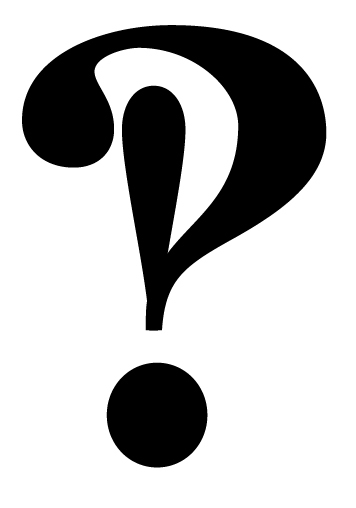 American Martin K. Speckter invented the interrobang in 1962. As the head of an advertising agency, Speckter believed that advertisements would look better if copywriters conveyed surprised rhetorical questions using a single mark. He proposed the concept of a single punctuation mark in an article in the magazine TYPEtalks. Speckter solicited possible names for the new character from readers. Contenders included rhet, exclarotive, and exclamaquest, but he settled on interrobang. He chose the name to reference the punctuation marks that inspired it: interrogatio is Latin for "a rhetorical question" or "cross-examination";bang is printers' slang for the exclamation point. Graphic treatments for the new mark were also submitted in response to the article. In 1966, Richard Isbell of American Type Founders issued the Americana typeface and included the interrobang as one of the characters. In 1968, an interrobang key was available on some Remington typewriters. During the 1970s, it was possible to buy replacement interrobang keycaps and typefaces for some Smith-Corona typewriters. The interrobang was in vogue for much of the 1960s, with the word interrobang appearing in some dictionaries and the mark itself being featured in magazine and newspaper articles. The interrobang failed to amount to much more than a fad, however. It has not become a standard punctuation mark. Although most fonts do not include the interrobang, it has not disappeared: Microsoft provides several versions of the interrobang character as part of the Wingdings 2 character set (on the right bracket and tilde keys) available with Microsoft Office. It was accepted into Unicode and is present in several fonts, including Lucida Sans Unicode, Arial Unicode MS, and Calibri, the default font in the Office 2007 suite. The French equivalent is "point exclarrogatif", expressing a similar idea - the fusion between "point d'interrogation" and "point d'exclamation".